As I noted in a previous post, there’s great diversity in persimmon pudding recipes, because they’re almost impossible to ruin. Unlike a cake or bread, a puddng’s moisture content and texture can vary quite a bit and still have mouth-appeal. 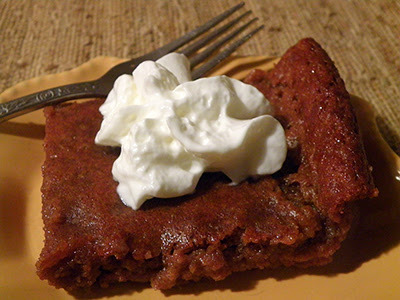 Because this recipe is egg-free, its texture is looser than Persimmon Pudding I. For that reason it requires a bit more finesse, and a larger spatula, to cut and serve in squares. An easier alternative is to bake it in a deep casserole dish and scoop servings out into bowls. A large quantity of buttermilk, rather than a smaller amount of cream or whole milk, makes this old school recipe unique. 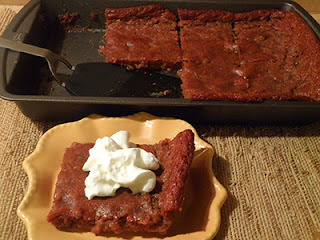 Tara Knight-Mize wrote Country Cookin’ using recipes that her grandmother left behind when she passed, including the persimmon pudding that I used as a basis for this recipe. 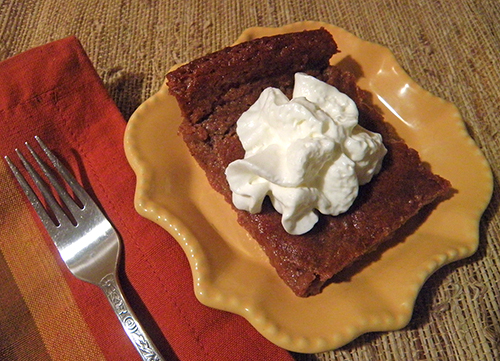 The most fascinating thing about Tara’s grandma’s persimmon pudding is the ultra-low amount of fat (butter). You can reduce the fat even more by using lowfat or fat-free buttermilk. Wary that other persimmon puddings all contain baking soda or powder, I added some, but it’s probably necessary. The original recipe contained no spices or salt at all, and you could choose to make it that way. I also experimented with adding vanilla, but concluded that vanilla is optional. 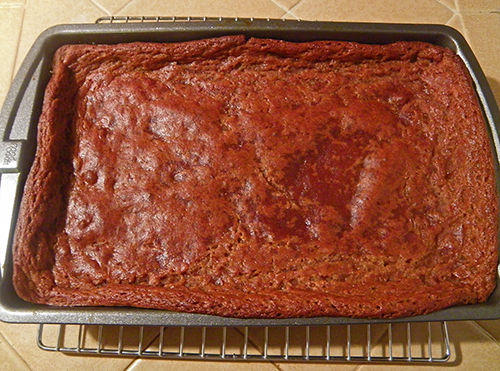 Because I reduced the original amount of sugar by half, or ¾ cup, I felt compelled to add an extra ¼ cup flour. This nagging thought turned out to be good intuition. As always, evaporated cane juice is my sugar of choice. If you froze persimmons earlier this year, now is a good time to use them up. Don’t wait until they go brown (been there, done that). Once the weather gets warmer, we tend to prefer lighter dessert fare, and frozen persimmons with spices have less appeal than fresh strawberries with cream. Feel free to get creative with your persimmons and make up your own pudding with ingredients on hand—using this and my previous recipe as guidelines. It’s truly hard to go wrong. Let us know with a comment if you come up with a new family favorite! Grease a 7” x 11” or slightly larger baking pan, or a deep 8-inch casserole dish. Preheat oven to 350 degrees F.
Blend together persimmon pulp and baking soda with immersion blender, or force persimmons through sieve and beat in baking soda. Set aside. In medium bowl, whisk together sifted flour, sugar, salt, cinnamon, nutmeg and ginger. Set aside. Measure buttermilk into another medium bowl. Beat in persimmon mixture until well blended. Stir in vanilla and cooled melted butter. 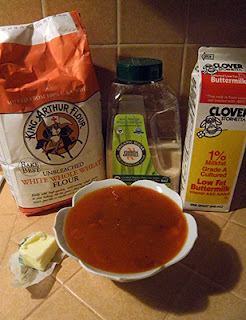 Stir flour mixture into buttermilk-persimmon mixture until well blended. Turn into greased pan. Bake at 350 degrees F until completely set and toothpick comes out clean, about 45 minutes (longer if using deep casserole dish). Pudding will puff up when baking, but will collapse back into the pan when cooled. For best results, wait until pudding is cool before slicing. Serve at room temperature. Garnish with whipped cream, if desired.